If you have decided that turfing is the right option for you, the next task is choosing the right turf. How to choose the right turf for your particular lawn? Well, every company grows their own turf varieties, so if you are unsure about which turf to go for then speak to your chosen supplier for advice. Family Back Garden – If you are looking to redo your family back garden then look for a turf that is Rye Grass based. This means the turf will be hardwearing and easy to maintain. Ornamental Lawn – If you are after a more ornamental lawn, then rye grass is usually less desirable. Look for a lawn that is predominantly fescue grasses rather than rye grass. This will give it a more ornamental appearance but does require a bit more TLC to keep it well maintained. Here at Online Turf we grow and harvest four different varieties of turf. If you’re struggling to choose the right turf for you, hopefully we can help..
Stadium Turf – This is our most popular turf in the range. It is perfect for a family garden with a high proportion of Rye Grasses making it hard wearing and easy to maintain. This is the turf that many local landscapers know us for, and they are happy to use on all of their projects. If it is a nice family garden lawn that you are after – Stadium is the turf for you. Rye Gold Turf – Similar the Stadium turf, this is a more hard wearing version. If you think your garden takes a bit more wear and tear than the average family garden, maybe if you have lots of dogs running around too, then Rye Gold is a good choice for you. This is very durable, whilst being aesthetically pleasing with its fine blades. Budget Turf - As the name suggests, this is our most economical option and is perfect for a family garden where budget is a key factor. Similar to the stadium turf but a slightly lower grade, this will still give you a lawn to be proud of. All of our turf comes with a weed-free guarantee on delivery, excluding the budget turf. Don’t let that scare you though, it isn’t full of weeds it is just exempt from the guarantee in case the odd one has sneaked in when we weren’t looking! When looking to create or re-do a new lawn, you may get confused with all the different varieties that are on offer and not know where to start. Follow our steps below to help choosing a bit more straightforward. To Seed or to Turf? If you aren’t sure whether to use grass seed or turf in your garden then hopefully we can help. There are advantages to using both so depending on your project you may find that one is better suited than the other. Both laying turf and sowing seed require the same soil preparation which is often the most labour intensive part of the process, after that the main deciding factor is whether you want an instant lawn or if you are happy to let the seed grow in time. • A box of seed is cheaper than buying enough rolls of turf to do the same area. • There are a wide range of seeds, specifically designed for almost any need, from family lawns to pony paddocks and everything in between. • It is quick and easy to spread by hand. • Seed takes a while to become a lawn. It will need a couple of months to start to become established and look like a lawn and will need to be kept off in its early stages. • After sowing, seeds can be lost from the surface due to rain, wind and birds feeding on them. • Needs a lot of TLC for the first couple of months to ensure it gets going, including quite intensive watering. • Sowing seeds needs to be done at a specific time of year, usually early autumn or spring. There are times of the year that seeds will not germinate. • One minute you don’t have a lawn, and the next you do! You get an instant lawn which can be used within about a month of laying. • It will not wash away with heavy rainfall and the birds will struggle to steal it! • Watering is still required in the first week or two but turf doesn’t need quite as much watering as seed does. • Unlike seed, turf can be laid all year round even in the winter months. As long as the ground isn’t frozen solid, you can start laying! • Choice is more limited than with seed, however turf growers produce and harvest turf to suit demand, so you can usually find something that will suit your needs. 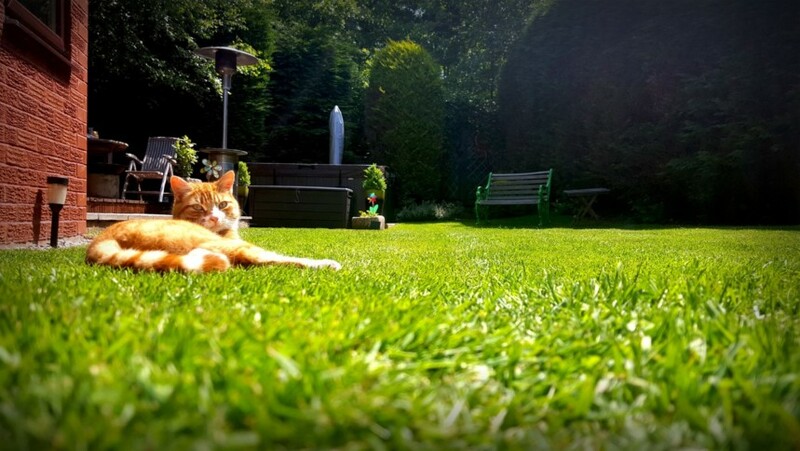 • Rather than scattering some seed when you have a free afternoon, turf requires a bit more advance planning as it needs to be laid as soon as it is delivered.